Hot on the heels of the spectacular naming ceremony for Anthem of the Seas on Monday, Royal Caribbean International, the world’s largest global cruise line, has announced Explorer of the Seas has docked in Southampton having just taken part in a 40-day, bow-to-stern full revitalisation. Part of Royal Caribbean’s ambition to constantly push the boundaries of the holiday experience, Explorer of the Seas has been fitted with exciting new technology, entertainment and dining features. Highlights of Explorer of the Seas’ revitalisation include the addition of 81 new Virtual Balcony Staterooms - an innovative design concept unique to Royal Caribbean which offers expansive real-time views of the ocean and destinations – and 24 new Panoramic Ocean View Staterooms, offering floor to ceiling wraparound panoramic windows. A FlowRider 40ft surf simulator has also been added alongside a 220 square foot outdoor cinema screen showing first-run movies, big sporting events and giant video game challenges. Holidaymakers can now also enjoy a print-on-demand Focus Photo Gallery, an art gallery spread throughout the ship displaying original works and new restaurants and bars. These include Giovanni’s Table traditional trattoria, Chops Grill steak house, Izumi Japanese cuisine, R Bar and The Tavern sports bar. 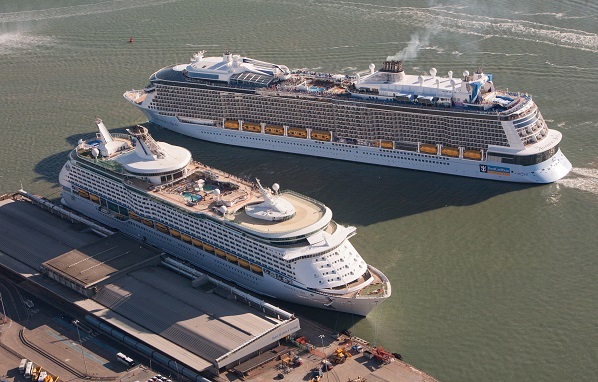 Stuart Leven, managing director, UK & Ireland for Royal Caribbean International, said: “We’re on a mission to change holidaymakers’ expectations and just as Anthem of the Seas set sail this week on her maiden voyage, a newly refurbished Explorer of the Seas arrived in Southampton today.